(Nanowerk Spotlight) Two years ago, we reported on a novel metal-free catalysis technique, developed by scientists at the Fritz Haber Institute (FHI) of the Max Planck Society in Berlin, where nanocarbon was used for the oxidative dehydrogenation of ethylbenzene to styrene or butane to butadiene ("Nanotechnology catalyst improves important reaction in the chemical industry"). Research like this is part of an effort to find energy-saving and non-polluting catalysts that can be used in conventional reactions. Catalytic dehydrogenation of ethylbenzene is one of the most important processes in the chemical industry world-wide. Styrene, for instance, is commonly produced using this process. The annual production of some 20 million metric tonnes of styrene (source) is an important precursor in the plastics industry. Being able to develop a new metal-free, energy-saving, and efficient catalyst for alkane dehydrogenation would have a significant positive impact on the environment. Coke formation during the current industrial process is the main disadvantage of the metal-based catalysts now used. Steam is used as a protection agent to avoid coking and thus keep the catalysts (promoted iron oxides) active. The steam generation consumes massive amounts of energy. This is simply solved by using carbon as catalyst material. Even without steam, the catalyst is free from coke formation and shows long time stability. The FHI team, together with collaborators from Shenyang National Laboratory for Materials Science, have now developed a new process for the dehydrogenation of ethylbenzene, using nanodiamonds as catalyst, that is oxygen-free – and therefore safer and with high selectivity – and steam-free. Reporting their findings in the October 1, 2010, online issue of Angewandte Chemie International Edition ("Surface Chemistry and Catalytic Reactivity of a Nanodiamond in the Steam-Free Dehydrogenation of Ethylbenzene"), the team describes the application of nanodiamond as a novel catalyst for direct dehydrogenation of ethylbenzene under steam-free conditions. "We use only carbon in form of sp3-bonded carbon to catalyze the reaction for styrene production" Dangsheng Su explains to Nanowerk. "In doing so, we have also demonstrated how applying the "nano" concept to carbon gives a major advance in catalysis with great potential in the chemical industry." For their work, the team used nanodiamond that is commercially produced by detonation synthesis. Nanodiamond is much more active and selective than other carbon materials, including carbon nanotubes, nanographite, activated carbon, and mesoporous carbon. The 4-8 nm small nanodiamond particles are in form of a diamond-graphene core–shell structure. The diamond nanoparticle at the core is about 5±2 nm in diameter, and a highly defective and oxygen-rich graphene layer forms a curved surface. They tested the catalytic activity of nanodiamond was evaluated at 550°C under atmospheric pressure by using diluted ethylbenzene as reactant. "Nanodiamond shows 2.8 times the steady-state activity of the typical K-promoted Fe2O3 catalyst that we used" says Su. 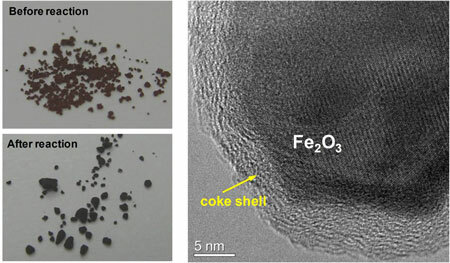 In our experiments, we found heavy coke formation on the used K-Fe catalyst, which is believed to be the major reason for its low activity by blocking most of the active surface. Another interesting finding is that the high initial activity of nanodiamond can be fully restored by flowing air through the catalyst at 400°C." The researchers observed similar results after five successive regeneration runs lasting for a total of 120 hours. "Moreover" says Su, "the used nanodiamond displays remarkable stability over a long period of time. The yield and selectivity are greater than 20.5 and 97.3%, respectively, and suggest a bright future for industrial applications." He notes that the simplicity of the defective graphene makes it a promising model in complicated reaction scenarios, which are impossible to unravel with metal oxide systems due to the inherent chemical complexity, including terminal and bridging lattice oxygen, various forms of polyvalent metals, and side reactions. "We believe there is still a lot of room for more novel catalysts, and a clear understanding of the mechanism is still required" he says. Therefore, while the technical implications of this work could revolutionize the current styrene synthesis industry, academically it open a new research field of carbon-only catalysis for sustainable chemistry. Next steps for the team are finding ways to apply nanocarbon to other industry process and test graphene as a catalyst.